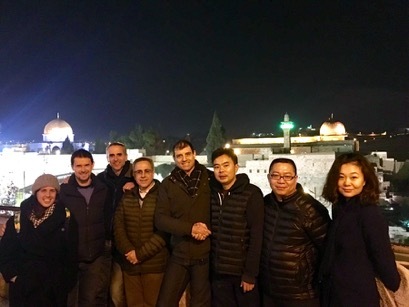 On December 29, 2016, which is also the sixth day of Israel’s traditional Hanukkah Festival, Guoshu Technical (Beijing) Limited Company and Israel’s EyeClick Company announced comprehensive cooperation and signed an exclusive distribution agreement at Jerusalem’s holy Western Wall. This followed the formal signing of a MOU between Guoshu Technical Company and EyeClick in Beijing on November 16, 2016, as is yet another achievement in high-technology cooperation between enterprises in China and Israel. The founder and general manager of Guoshu Technical (Beijing) Limited Company Dr. Yuan Guoshu stated that a visit to the global headquarters of EyeClick in Tel Aviv, Israel, enabled them to learn about EyeClick’s global leadership in software algorithms and hardware integration, leaving the deep impression that Israel’s reputation as an “innovative country” that has been earned by its enterprises is well-deserved. For the Chinese market, Guoshu Technical Company and EyeClick worked together to jointly establish the “Guoshu EyePlay” brand, also setting up a hardware factory in China and opening a customer experience center at No. 6, Zhongguancun South Street in Beijing. EyeClick is a global leader in projection entertainment system products, with its floor projection systems, desktop projection systems, and wall projection systems providing an immersive and exciting interactive entertainment experience in any physical space. EyeClick products have been shown to be an effective tool to attract children and families. Repeated visits by children can bring more value to your business and venues. Over more than a decade, thousands of EyeClick products have been successfully installed in restaurants and malls, including McDonald’s, Burger King, KFC, and Ikea, as well as museums, including science and technology museums, education centers, entertainment centers, hotels, and hospitals, covering more than more than 80 countries around the world, with its interactive experience providing enjoyment for millions of children around the world. The Qinghai Museum of Science and Technology has been the first science and technology museum in China to order “Guoshu EyePlay” products. According to reports, in September 2016, Guoshu Technical Company and EyeClick signed their first contract at the China-Israel Innovation and Investment Summit held in Tel Aviv, Israel, receiving widespread attention. In November 2016, Guoshu Technical Company and EyeClick jointly participated in the Seventh China (Wuhu) Popular Science Products Expo Fair held in Anhui. According to other reports, in November 2016, the governments of Israel and China signed a “Memorandum of Understanding on Developing Cooperation under the Framework for Economic and Technical Cooperation” in Jerusalem, and published the “Report on China-Israel Economic and Industrial Planning” and the “Joint Statement on the Second Meeting of the China-Israel Intergovernmental Mechanism of Economic and Technological Cooperation,” with business cooperation opening up excellent prospects for future cooperation and providing strong policy support.